Browsing articles tagged with " knee problem"
A Total Knee Replacement is a surgical procedure whereby the knee joint is replaced with artificial material. The knee is a hinge joint which provides motion at the point where the thigh meets the lower leg. During a total knee replacement, the end of the femur bone is removed and replaced with a metal shell. The end of the lower leg bone is also removed and replaced with a channeled plastic piece with a metal stem. Depending on the condition of the kneecap portion of the knee joint, a plastic “button” may also be added under the kneecap surface. Osteoarthritis usually occurs in people 50 years of age and older and often with a family history of arthritis. 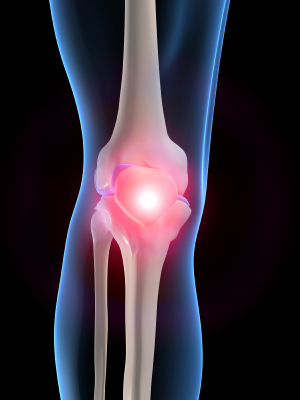 The cartilage that cushions the bones of the knee softens and wears away due to wear and tear. The bones then rub against one another, causing knee pain and stiffness. Rheumatoid arthritis is a disease in which the synovial membrane becomes thickened and inflamed, producing too much synovial fluid that overfills the joint space. This inflammation can damage the cartilage and eventually cause cartilage loss, pain, and stiffness. Total knee replacement surgery is considered for patients whose knee joints have been damaged by either progressive arthritis, trauma, or other rare destructive diseases of the joint. 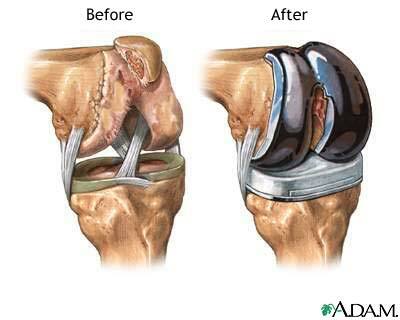 The most common reason for knee replacement in the United States is severe osteoarthritis of the knees. Decisions regarding whether or when to undergo knee replacement surgery are not easy. Patients should understand the risks as well as the benefits before making these decisions. What are the risk of Total Knee Replacement? Risks of total knee replacement include blood clots in the legs that can travel to the lungs. Pulmonary embolism can cause shortness of breath, chest pain, and even shock. Other risks include urinary tract infection, nausea and vomiting, chronic knee pain and stiffness, bleeding into the knee joint, nerve damage, blood vessel injury, and infection of the knee which may require re-operation.